If you have been searching for a brand new low-maintenance home, then don’t miss out – this one is for you! This gorgeous house is being built with mix materials – brick and weatherboard claddings. This beautiful family home boasts 4 double bedrooms including 1 master bedroom with ensuite and walk-in wardrobe and 2 modern bathrooms. The heart of the home is set in the contemporary open plan kitchen and dining area which flows seamlessly to the outdoor living area. The gorgeous kitchen features stunning stone bench tops, trendy cabinets and Bosch appliances. The fully fenced backyard gives maximum privacy and is perfect for entertaining. Other modern executive features include double glazing, alarm system, gas cooking and more. 10 Years Standard Master Builder Guarantee ensures a peace of mind in your investment. Well positioned in close proximity to shops, public transport, cafes, restaurants, and social activities. 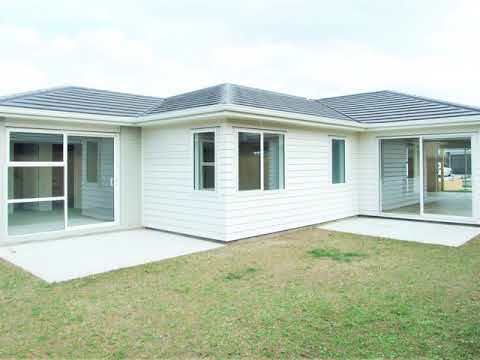 It’s within minutes walk to the vibrant Takanini Village, Southgate shopping centre and Bruce Pullman Park. This family home is perfectly positioned for a great lifestyle and convenience.